Gojong, the Gwangmu Emperor (July 25, 1852 – January 21, 1919), reigned 1863-1907 served as the twenty-sixth and final king of the five-century long Korean Joseon Dynasty. He reigned during the years leading up to the end of the monarchy and Korea's entry into the modern world. During the later part of his reign, he declared Korea an empire thus becoming the first emperor of the Korean Empire. With the annexation of Korea by Japan in 1910, the empire dissolved, and was never reestablished. Gojong took the throne in 1863 when King Cheoljong died without an heir. The Dowager Queen Sinjeong, mother of King Heonjong, the king before Cheoljong, orchestrated twelve year old Gojong's succession to the throne. Cheoljong's Queen, Cheonin, opposed the choice of Gojong as Cheoljong's successor. The Dowager chose Gojong over his older brother, Yi Jaemyun, to enable her to rule as regent longer. Together with the Dowager Sinjeong, his father, Regent Heungseon (Daewongun), ruled for Gojong until he reached adulthood. The Daewongun restored Gyeongbokgung as the seat of royalty during his regency. In the early years, Daewongun's job as Regent drew little criticism; however, his policies of isolationism became harder and harder to maintain. Japan and China had already entered into active relations with western powers, and those powers began to turn their eyes toward Korea, as evidenced by diplomatic and then military advances by France (1866) and the United States (1871). When King Gojong reached twenty-one years old, criticism of the Daewongun's policies had increased. Royal officials called for Gojong to take the throne and govern directly. Although Daewongun relinquished his regency in 1873, Queen Min emerged as the real power behind the throne. In March 1866, at thirteen years old, Gojong had married fourteen year old Min Jayoung. The Daewongun had chosen her partly because she had been orphaned at a young age, thus her parents were not around to interfere with palace politics. Daewongun mistakenly thought that he could easily control Min Ja-young. Her political skill, intelligence and strength of character out-weighed her lack of family influence in the royal court. Gojong, with the influence of Queen Min, adopted more of an open-door foreign policy than his father had maintained. He signed a Treaty of Amity and Trade with the United States in 1882, hoping to gain protection from the imperial designs of neighbors Japan, China and Russia. That proved a futile hope as the struggle between those three Asian powerhouses erupted into the Sino-Japanese War (1894–95) and, later, the Russo-Japanese War of 1905. Russia seemed to have the upper hand; the Russian consul in Seoul, Karl Ivanovich Weber, developed a personal friendship with Gojong, and after the assassination of Queen Min in 1895 by the Japanese, Weber personally offered the King refuge in the Russian Legation. 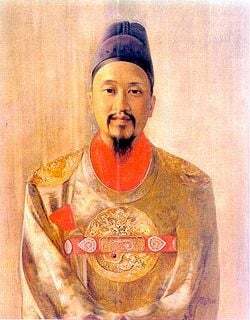 Gojong proclaimed Korea an empire in 1897, receiving the title of Emperor Gwangmu; thus sitting as the last monarch of the Joseon Dynasty and the first of only two in the Gwangmu era. He intended to place Korea on a par with China and strengthen Korea against Japanese aggression. His domestic and foreign policies proved successful at first. In the face of growing Japanese pressure, Gojong played the rival Russian, Japanese and Chinese sides off of each other to prevent each of them from totally controlling Korea. His domestic policy of industrializing Korea met with a measure of success as well. He entered into a series of treaties and agreements that were disadvantageous for Korea, feeling that such a course was better than risk two rivals dividing Korea between themselves (Russia and Japan had discussed dividing Korea at the 38th parallel as early as 1896). His efforts at maintaining a sovereign independent state finally ended after the Russo-Japanese War (1904–05). Victorious Japan's Meiji Emperor forced Gojong to accept pro-Japanese advisors to the royal court. Soon afterwards, Japan forced Gojong to sign the Protectorate Treaty of 1905 between Korea and Japan, which stripped Korea of its rights as an independent nation. Gojong sent representatives to the Hague Peace Convention of 1907 to try and re-assert his soveriegnty over Korea. "The United States does not realize what Japan's policy in the Far East is and what it portends for the American people. The Japanese adopted a policy that in the end will give her complete control over commerce and industry in the Far East. Japan is bitter against the United States and against Great Britain. If the United States does not watch Japan closely she will force the Americans and the English out of the Far East." As a result, an enraged Meiji forced Gojong to abdicate in favour of Gojong's son, Sunjong. Sunjong ruled for just three years before the Korean Empire ended with the annexation of Korea by Japan in 1910. Gojong opposed the Japanese annexation of Korea up until his death in 1919, and the March 1st Movement for independence chose to schedule their first uprising against the occupation government for a date coinciding with two days before Gojong's funeral. Gojong's royal tomb, Hongneung, which he shares with Queen Min, is located in the city of Namyangju, northeast of Seoul. After Gojong took over the leadership of the country from his father Daewongun, in 1873, he allowed most of Daewongun's reforms to stand, notably the dissolution of the sowons, private academies operated throughout the country by yangbans, which had become breeding grounds for political factions, and enjoyed unbalanced tax-free status. During his reign Deoksugung palace, refurbished by Daewongun, once again became the seat of royal power in Korea, as it had been centuries before. In contrast to Daewongun, King Gojong and Queen Min began to open the doors of the country to foreign presence. For the most part, Gojong’s intention in beginning his alliance with Japan, signified by the Treaty of Ganghwa in 1876, was to free Korea from the long-standing overbearing influence of China. In 1882, he went one step further, and established a foreign office, welcoming Prussian statesman Paul George Mollendorff into the foreign office as an official advisor to the crown. In 1883, at the urging of progressive elements, he authorized publication of the nation’s first newspaper, the Hansung Sunbo, and the following year established a postal system, modeled after those in Japan and China. In 1897, he declared Korea an Empire, elevating the country to the same status as Japan and China. Later, in 1898, following the recommendation of the Independence Club, he issued a proclamation that elections for a senate would be held and the country would become a constitutional monarchy. But he had to back down under pressure from the current ranking officials, who feared losing their influence, and the elections were postponed, and ultimately canceled altogether. He continued to strike alliances, unfortunately, almost uniformly disadvantageous to Korea, in efforts to keep the country from being sliced into pieces by the Japanese, Russians, Chinese and other powers who had their eyes on the small peninsular nation and its advantageous location, linking Russia and Asia. In the end his efforts ended up landing the country under the control of the Japanese, in the early years of the twentieth century, where it remained until the end of World War II. Yi Cheok (Hwangtaeja), fourth son with his first wife, Empress Myeongseong. He was married to Miss Min, a daughter of Min Tae-ho—a leader of the Yeoheung-Min clan—known posthumously as Empress Sunmyeong; however, she died before her husband's enthronement. Cheok married again Miss Yun, a daughter of Yun Taek-yeong, who became known as the Empress Sunjeong. Yi Gang (Uihwagun or Uichinwang), fifth son with his partner, Lady Jang, (30 March 1877 – August 1955); He married Kim Su-deok, who became Princess Deogin; a daughter of Baron Kim Sa-jun. Yi Eun (Yeongchinwang), seventh son with his second wife, Princess Consort Sunheon, (20 October 1897 – 1 May 1970), (see Crown Prince Eun); He married Princess Masako Nashimotonomiya of Japan, a daughter of Prince Morimasa Nashimotonomiya of Japan. Yi U, ninth son with his partner, Lady Bohyeondang; unfortunately, he died in infancy. Lady Deokhye (Deokhye Ongju), fourth daughter with his partner, Lady Bongnyeong-dang, (25 May 1912 – 11 April 1989); she married Count Takeyuki Sō, a Japanese nobleman of Tsushima. 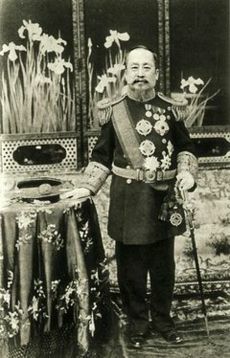 His Imperial Majesty The Emperor Emeritus of Korea (大韓帝國太皇帝陛下 대한제국태황제폐하 Daehanjeguk Taehwangje Pyeha) (1907–1910), after his abdication by force of the Japanese government. ↑ M. Volkov, May 2004, Русские в Корее- имена и судьбы (Russians in Korea - Names and Fates). Korusforum Journal, Center for Contemporary Korean Studies, Russian Academy of Sciences (23). Retrieved April 6, 2008. 대한제국 고종 (Gojong of the Korean Empire) Korean Language Wikipedia article Retrieved April 7, 2008. History of "Emperor Gojong of Korea"
This page was last modified on 20 September 2013, at 16:31.